The Northfield Community School was developed as a platform to enable personal exploration while fostering neighborhood interaction. The PK-8 school condensed assets of the four antiquated facilities scattered throughout the town, re-configuring them in a new centralized complex. Providing diverse programs that appeal to a range of ages with different schedules insured that the community school would be utilized to its’ maximum potential while providing efficiencies and a vibrancy previously not available. The school is a true community school, open seven days a week for a variety of community activities. The project melds community programs with the school while making certain that community access would not impact the academic wings. With a clear differentiation of uses, the public maintains a relationship to the academic wing while never having to enter the school portion of the building. The large population and disparate programs accommodated within the school necessitated careful attention to the perceived scale and circulation of it’s various users. Considered as a number of schools within a school, interstitial and public spaces gained importance and were utilized as means of joining scales. Framed views offer glimpses that allow one to reference oneself within a greater context. 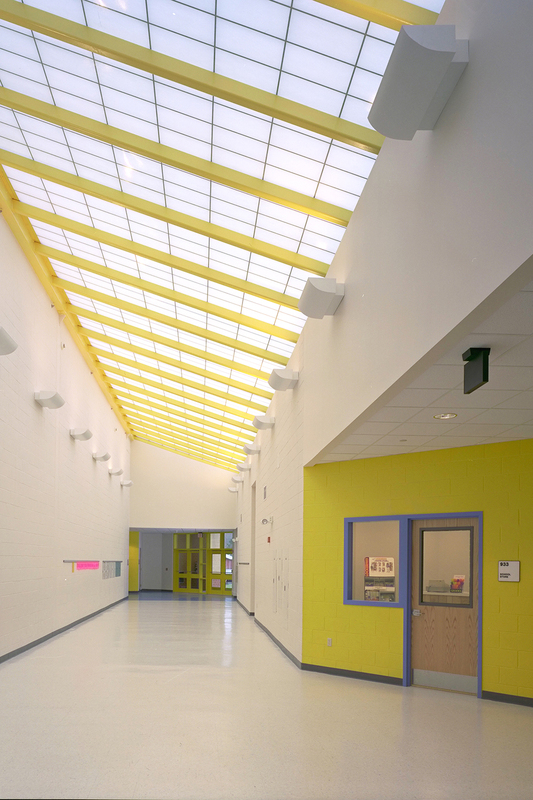 Corridors and communal spaces are oriented to provide physical and visual connection to one’s grade, school, and community, when deemed appropriate, while maintaining the safety and security of the children as a priority.